As I sort of mentioned when I started this piano playing adventure last summer, it happened by chance, and came together very haphazardly and on the fly. By chance of course I mean when I came to dance camp, I had absolutely no intention of accompanying classes and it was only because I was heading back home for a day that I was able to grab my music. This year, of course, I had more or less ten months to prepare. Not that I used those ten months haha! But I did set aside one afternoon a few weeks ago to prepare my music binder, because really, if you’re music isn’t organized, you are sunk as an accompanist (or you better have everything memorized). There are probably many ways to organize your music, but here’s how I’ve got mine set up. Supplies you would need: a 3 ring binder, dividers, sheet protectors (or a three hole punch) and your music, obviously. You may additionally want a few sheets of loose leaf paper. First of all, I would suggest not making double sided copies. Yes, it’s going to save you paper and the environment, but you may decide you don’t want a song, or, depending on how you organize the binder, you may need to change the order. And then what? Before you even start putting your music into sheet protectors, you have to decide how exactly you’re going to organize the book. I’ve organized my book into the following sections: pop, Ukrainian, 2, 3, 4, 6. This is what works for me; it may not work for you. The reason why I chose to organize this way is because of my accompanying situation. 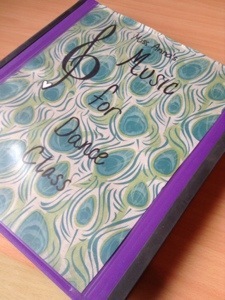 I work primarily at a dance camp where I am accompanying with any one of three different teachers, and they all have their own preferences for music and class order. One prefers more contemporary music, one prefers more classical. One has a lot of experience working with accompanists, one doesn’t. Their experiences are varied and each class is absolutely different. So when I’m accompanying for a class, I don’t quite know what to expect. I have an understanding of the general order of dance class and what is required from the dancers for each exercise, but there’s really no set order (and even if there was, there would be three set orders, not just one). The easiest way for me to set up my binder is to group the contemporary music all together (though I may assimilate those into the other sections at some point) my Ukrainian tunes all together (because I rarely use them and when I do it’s not for ballet class), and then to organize my classical music by meter. I could go on and on, right here and right now, about how a 6 could function as a 2 or a 3, and how a 3 of course could also be a 6. But I won’t. If you’re at the point in your life where you are accompanying dance classes, you probably already know what I’m talking about. Maybe I’ll make it another post. If you don’t organize your binder by meter, you could also organize simply in alphabetical order (this is how I worked last year and I have to say that was also pretty successful). You could also organize it by the class order, songs specifically for plies, or grande battement, etc, but this will only be helpful for you if you have a specific set of songs for each type of exercise (many of my songs pull double or triple duty). Now that you’ve figured out how to organize your binder, start putting the music in the sheet protectors. Double up where you can; also, if you have a piece that is two pages long, put them in two different protectors so they can face each other. This sounds like it may be common sense, but if you’re thinking with the organizational part of your brain to put this binder together, you may not be thinking with the piano playing part of your brain that wants to avoid page turns. You could use a three hole punch for this step as well, but you could end up damaging the paper on the long run. You’ll also end up having to turn a lot more pages, which could get tedious, depending on how much music you have. Once your music is in the binder, you may want to take this optional step and make a list of all your music to keep out to the side as you accompany, like an index. The first time you make this list, leave some space in case you add pieces later. Having a list like this will be helpful if you don’t have the greatest memory (like me). If it’s up to you to choose the pieces, having the list will help you quickly make a decision, if you are familiar enough with your repertoire (and you should be!) that just looking at the title will remind you of how the pieces go, even when you have five or six waltzes listed in a row. And that’s it, your music is ready for dance class! More important question – are you? If you are a budding dance accompanist and have a question, please feel free to ask! Share the post "Dance Accompanying: Preparation"
Dance Accompanying: Who am I and what do I know anyway?